This Barth is owned by a master mechanic who now has dementia. It has a 300hp caterpillar engine that purrs like a cat. (no pun intended) We just drove it around town. It runs great. Spedometer and mileage are tracked by GPS. Its a 32ft. Spartan chassis. It is located in Naples,FL. The hitch is rusted and needs to be replaced. Kim, Thank you for offering your Barth to our members here. I urge you to post a phone number here too. Many of our members prefer to chat with the seller personally. Good luck with your sale. 3208 CAT? Turbo? What Allison? A strange one, indeed, proving that Barth would make any combo you wanted. It's very rare to have a Cat in a Spartan chassis. IIRC, the N/A 3208 was rated at 225 hp, the turbo was 250, and the turbo with aftercooler was 300. Here is the email Evan. Please post the price here when you find out. Thanks, nice to hear from you EVAN! I sent an email to this email address to get the price and got an answer back saying ,"It's still for sale, asking 12." I sent another email and said I might be interested, but would like to see a picture of the driver's side, and asked if it would be driveable as is, and the condition of the appliances, a/c, generator, and tires, but never got a response. Anybody else tried to contact them? Also the data tag Kevin posted has a date of 4/89 but the listing says it's a 1991?? Is this just another Craigslist scam? This coach was built in 10 of 90 according to the Data Tag. It could very well be titled as a 1991. Also the data tag Kevin posted has a date of 4/89 but the listing says it's a 1991?? Is this just another Craigslist scam? 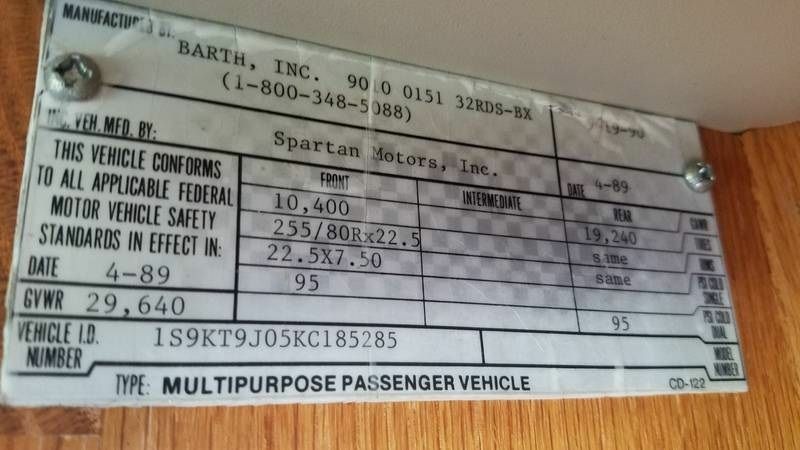 The 4/89 date is Spartan chassis build date not Barths. The 10/90 is Barths build date witch make it a 91. I don't think that the Cat is a 3208. In the photo of the engine, it appears to be an inline (6). Probably a Cat 3176, which could be rated at 300 HP. Nice catch Dan. I think you are correct. The data tag project shows build number 0154 and 0155 to have 3176 motors. The build number above is 0151. Could be the factory purchased several frames with the 3176 Caterpillar during this time? Check out the variety of the 3176 engines. I would ask for the Cat s/n and call Cat for the actual data. The info above says some are great while early ones are poor.